You've tricked and fooled your readers for years. You've tortured us all with surprise endings that made no sense. You've introduced characters in the last five pages that were never in the book before! You've withheld clues and information that made it impossible for us to guess who did it. But now — the tables are turned. Millions of angry mystery readers are now getting their revenge. When the world learns I've outsmarted you, they'll be selling your $1.95 books for twelve cents. Genre literature, detective fiction included, tends to sacrifice (or fail to achieve) fuller characterizations either due to the needs of plot or the inability of authors to meet the ordinary needs of three-dimensional personalities in "literature." A more generous person likely thinks the formats and demands of genre stuff infringe on character portraits, and a cynic sees an author running off to genre because he hasn't the talent to make the real world interesting. All too often the evidence points to the latter condition. For one thing, it's highly unlikely that a truly talented author would seek a genre in which his talents are held in abeyance; and, even if he did, it's less likely that he'd restrict his talents and not find a way to break them free. For another, in terms of detective fiction, all too often the evidence points to the author's disabilities and need for assistance. He creates that final equation and then prefaces it with hundreds of pages of fractured ideations of "what people are," exercising thoughtful-evocative muscles he simply lacks. Doubtless, to the author, this seems like heady stuff, but it takes only a few pages of Mrs. Padgett delighting in her peonies and Mrs. Addison sneering at her own maid to figure out who is a good person and who is a bad person and whether the author thinks humanity is better off in a bucolic and frugal setting instead of one of unreflective privilege. Pity the poor reader who doesn't give a damn about understanding the human condition right now, needs to pass the Atlanta-LA flight in peace and just wants to find out whether the blood got tracked down the garden path or whether the sprinklers or the gardeners with their water spouts washed it away. It'll be scores of pages before they'll find that out. Before then, they'll need to discover that Constable Grenville (like Andrew Wycke's Lord Meridew in Sleuth) is fat, because — most people would never notice this — he has to keep brushing the "crumbs of seedy-cake from the folds of his pendulous waistcoat." What a startling insight into the human condition—some people are fat! Given such an ungenerous opinion of detective fiction, you'd probably be right in assuming that a book left on the nightstand during a recent family visit would merit a dismissive sneer and nothing else in terms of attention. But there's no accounting for lack of sleep and willingness to roll over and cradle a book by a dim lamp to wish away unwanted hours. Mid-drowse, I was pleasantly surprised by Charles Todd's series of "Ian Rutledge" detective novels. Fans of the excellent ITV series Foyle's War will probably find immediate pleasure and familiarity in encountering Inspector Rutledge. (Whenever a good television series is in short supply, it's always gratifying to find a book series that picks up thematically where one leaves off. Only, in the case of the WWII-oriented Foyle's, the Rutledge series functions as something of a prequel.) Fans of detective fiction and history in general should be similarly pleased. 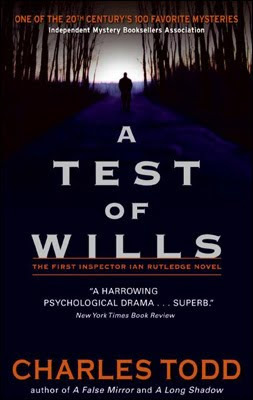 The series begins in June, 1919, in A Test of Wills (and continues monthly thereafter) and explores England's post-war atmosphere in the guise of old-fashioned insoluble death. Rutledge has survived years of The Great War and returned to his former position at Scotland Yard. A gifted investigator before the war, his superiors — all but an envious one — assume that his powers of detection remain as honed as ever. Unbeknownst to them, Rutledge suffers deep, tormenting shell-shock. He keeps hearing the voice of one of his men killed in the trenches. He even has conversations with him. The Rutledge series exhibits a few stylistic problems. 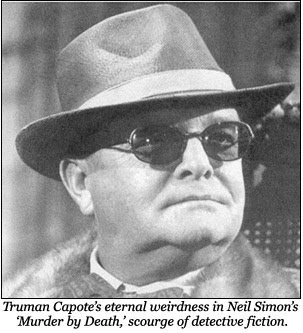 Published from 1996 to the present, the books sometimes employ idioms that originated post-WWI. Also, author Charles Todd (actually a pen name for Charles Todd and his mother Caroline, both of whom appear to be American) often seems to be writing about an England that existed less from 1919 onward and more in period BBC miniseries about post-war England. Obviously, neither lived through the period, unless mother Caroline is roughly 100 years old, so the environment presented evinces something of a pre-sanitized pre-mythologized era. At times, reading it gives you the impression that they watched Howard's End over and over and thought, "What if someone got stabbed to death?" Other problems are less endemic to time and more to the timeless frustrations of this kind of genre. Like the Lionel Twain quote above, this book is not entirely free of its share of detective fiction "outs." While the characterizations are a cut above, the ending feels slapdash: the protagonist blunders into the reveal with a kind of sudden efficiency that makes you think he knew he was running out of pages. In a modern mystery novel, one featuring a regular homicide detective, the solution coming almost from dumb luck and accident would exhibit a dash of realism, but here it seems dissonant next to the sauntering pace of the gentlemanly post-war mystery. I'm told that this sort of ending is not habitual for the series, and that sometimes Inspector Rutledge gets his man, sometimes gets it quite wrong and sometimes just gets lucky again. So long as this book's ending isn't a crutch, it feels a little honest. Even if it's not as conventionally satisfying, a man this mentally shattered might just blunder into the solution. It's in that respect that the book does its best work. Rutledge commands sympathy. Had he been a soldier whose life was blown apart only to see him effortlessly return to keen mental detection, he'd be a cloying figure meant to page-pad and frontload some "literary" depth on another cookie-cutter Holmes. But he's not like that. He's not a genteel English detective — he doesn't seem to eat at all, drink socially, tuck into tea-cakes or even like being around most people in general, and he's far from omniscient — and he's not a modern spiritualist in communion with the dead, either his or someone else's. Despite a recent spate of television shows in which a lead character regularly converses with the dead, Rutledge's internal tormented dialogue avoids the kind of melodramatic gimmickry we're all familiar with and that it easily could have become. What's left for the reader is, admittedly, something of an easy inroad to character development, but it works because it eschews any ponderous banalities about metaphysics and merely allows you to watch two characters handle each other. It just so happens that one is manufactured by the other's psyche, and though both are aware of the arrangement, both feel anger toward the other as if at another full person. Timeliness might also have added to Todd's conceit, making what could have been a disposable take on a familiar era and a familiar psychological worry seem poignant as both America and Britain manufacture more human beings broken in this same way. The Rutledge character no longer provides merely a tweedy and starched-collar retrospective of the police drama but a kind of back door to our own current experience. The society into which Rutledge is reintegrated and given his old job is one too polite to address how broken its servicemen are. And while, as readers, we might congratulate ourselves on our own probity in this regard by comparing our conduct to the psychologically tone-deaf supporting cast of the Rutledge novels, the fact remains that we have not come so far ourselves. They had shell-shock. We have PTSD. Both are labels, and both are, in many ways, woefully insufficient for understanding. But that previous era had ignorance and fear as an excuse. They literally didn't understand the phenomena happening to their soldiery, and they were afraid of breaking minds further — afraid, even, of the concept that they could be broken. We, with our self-congratulation, we who made a war and then destroyed people by sending them to it, we who asked them to fragment themselves perhaps forever while we made no sacrifices at home and even passed ourselves more tax cuts — we have no excuse for our squeamishness, for our dismissal, for our elemental need to pretend that everybody's going to be fine. If anything, our half-assed scientific awareness only exacerbates the problem, as we presume just a few prescriptions and some counseling will take that PTSD away. Indeed, the process of reading A Test of Wills creates a kind of continuum of outrage that runs from how Rutledge's contemporaries minimize and attempt to obscure the suffering of the surviving few among them and how present-day Americans and Britons can wave away all struggle with bottles and acronyms. It's a condition that says that the selfishness of euphemism is almost a constant. Fussell delights in this maliciously collectivized wordplay because he sat on the receiving end of it and watched as comrades were fed into taxonomy and rationalized into something totally humanly incredible that nevertheless relied on a patina of scientific credibility. You can imagine, then, the bureaucratic power and ironist's delight in a term like post-traumatic stress disorder. It has enough syllables to bury almost any horror comfortably. It's just a disorder! It's not even a disease or syndrome; a disorder can be fixed via some kind of spring cleaning. And it has hyphens, which means it must have been really thought out. I feel stressed just commuting to work—who doesn't feel stress! As said, the Rutledge novels feature some of the mystery-novel sins outlined at the top, but these ills pervade the genre and shouldn't single out these novels meaningfully. What should are Rutledge's ills. Mystery novels often fail to present a main character fully formed, but Todd cleverly circumvents this problem by creating a memorable character who is unmistakably inchoate. While the whole of him might never become unforgettable in literature, the situational presentation of his shards create a depth that elaborates on the "detective procedural" with empathy and humanity that the plots otherwise might lack. The novels themselves might never be timeless, but they offer a charming and amusing whodunit story strung throughout the timeless inner conflict of a person asked by civil society to do murder in defense of it. The horrors visited upon Ian Rutledge as he tries merely to do his job — the fatuous idea that one dead body could, in his policeman's guise, ever be anything so nightmarish as what he saw as an officer — could appear, at first, to be cloying and contrived distractions. While they entertain us with a good mystery, they also ask us what good — what anything — we can ask of men after we demand of them something so dire as programmatical evil. In the process, they elevate standard procedural moralizing over dead bodies to something that exists within the context of a society with an institutionally schizophrenic apprehension of murder. Even though Todd's conceit might seem extremely simplistic, there's an ethical and intellectual depth to asking a main character to ratiocinate and undo the same process he's been proven capable of executing himself. There, tucked in a little book about gardens and genteel killing, we have to ask, even if only during a moment's respite from a whodunit, which way this man has best served his state. Any mystery, under normal circumstances, would probably do well to come out a 2.5, and I think those above average should earn a 3. The Rutledge series, so far, gets a bump to 3.5 for being generally entertaining and mostly idiomatically and factually accurate, and for adding a far more thoughtful dynamic to the main character's purpose than can be found in your average mystery. Even if the depth here is created accidentally, it works. Perhaps future novels will make a crutch of it, some recurring trope that's all catch-words and no substance, but for now the interior-monologue struggles and the juxtaposition of trying to essentially "rescue" corpses for the sake of the record, rather than recording the creation of new ones, give it a heft not found in other novels in the genre.